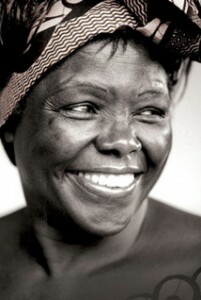 The Nobel laureate and founder of the Green Belt Movement, Wangari Maathai passed away yesterday. I’m not sure that there is a good time for such an amazing figure to leave us, but the current moment seems awfully unfortunate. As may be indicated by the recent waive of protests on austerity measures, the XL pipeline and wall street’s mode of operations, people seem exceedingly frustrated about the state of the economy, the environment, and a lack of leadership on national and international levels. Maathai dedicated her life to building active civic societies that could address both economic and environmental destruction with simple yet impacting solutions. The Green Belt Movement, which she founded and led until her passing, started with a simple idea that has profound meaning, both symbolically and in reality. They began by planting trees as a means of economic development, women’s empowerment, environmental restoration and the securing of sustainability for future generations. Think the Million Trees NYC campaign is impressive? (it is!) The Green Belt Movement wants to plant a billion and they have already planted 40 million.